This beautiful solid silver ring was made by a father for his daughter. 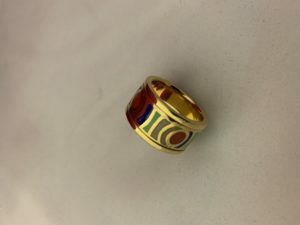 He wanted a thick gold plated finish to the ring. After a gentle clean in our ultrasonic cleaning machine, we electroplated the ring in 24k gold. Gold Rush Plating offers gold & silver jewellery plating to a wide range of items. Our plating services are second to none. Gold, Silver & Copper Plating. This cufflink and ring set arrived in a very tarnished state. After a good polish and clean they were ready for our electroplating service. Plated in Rose Gold using our dedicated jewellery plating tanks. 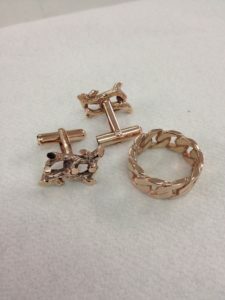 Gold Rush Plating offers a full range of electroplating including 24k Gold plating, Silver Plating and Rhodium Plating. We now also offer copper plating to plastics that can then be gold plated! !